Pro: You don't lose a full week to personal sick leave when your kid is sick. Con: You have to work a full week at home with a sick kid. Con: If you were single, the way you dress would NEVER get you a date. Ever. Pro: Listen to Journey's Greatest Hits three times in one day and never meet with disapproving glances from co-workers, "Are we really going to listen to that again?" Con: Nobody's cubicle half wall to lean over and talk to about Hollywood Week and who my favorites are. Pro: Nobody's cubicle half wall to lean over. Con: Misunderstanding of how to correctly structure logically proceeding Pro/Con sentence pairs. Pro: Loving what you do for a living. Con: Shut up and get back to work, big baby. You aren't the first person to ever be sick. Jeez. Pro: Inner self talk means never being truly lonely. Thanks for the great laughs. I hope you’re feeling up to laughing soon. Love that list! It’s missing a couple of things though. Pro: you can rearrange your schedule for appointments. Con: People hear that you work and home and assume that you don’t really work. They ask you to coffee and meetings everyday and are upset when you always say no. Thanks for the laugh! I’m so glad when my husband is at work and I CAN listen to things over and over and over…hope you and Cole feel better soon. You crack me up. Hope you feel better soon! Irish girl – can’t remember her name, but she sang Heart’s “Alone”. That girl can belt it! Hope you and Cole get better soon. Pro: You don’t have to use your lunch hour to make those personal calls that can only be done during “normal” business hours. Con: There’s no good excuse for avoiding the laundry. yeah, quitting work has totally put a crimp in my socalizing skills. I love your logics. I was just laid off from my job a couple of weeks ago. And I have decided to go into business for myself and work from home. So this was really amusing. I love working at home, but it does have it’s challenges. I just noticed your I HEART YOUTUBE and the movie Once is my favorite right now. I listen to the music over and over again every day. As you have pointed out, a pro to working at home. Tis very very true – Pro: Inner self talk means never being truly lonely. So I shouldn’t feel bad about wearing the exact.same.thing every day? 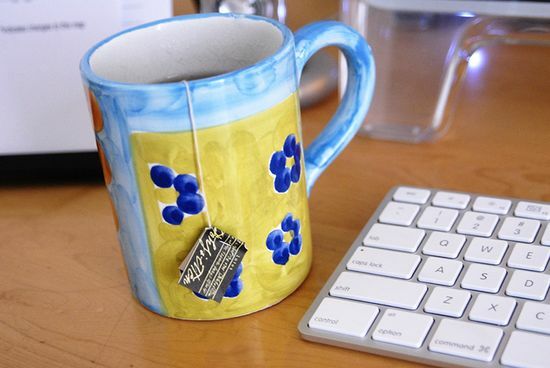 Pro: No one steals your tea bags or your favorite mug. p.s. What kind of tea are you drinking? I’d give my left nut to work from home. Wait. I don’t have a left nut to give. Well that’s how much I want to work from home. DEFINITE PRO: listening to Journey all day. Sigh. I want to be in your office. Cons: I’m not there listening to Journey all day. Steve Perry was my Snickers for SOOOO long (snickers: n. one that is the source of all happiness, that a person would choose above all else, that makes all others of the same type pale in comparison). I wanted to marry him. Or at least have his babies. Or at least try. You’re funny even when you’re sick. Hope you’re feeling better soon! AMEN Cathy & Amy !! Long live Steve Perry !!! Should I admit I have a picture of him on my desk at work that I gaze at constantly? First of all you are the funniest frickin’ person in the world…check my blog it says so right on the page. Secondly…this post most certainly reeked of meth-laced sudafed. I’m so jealous. Journey “Live” a good listen! I’m not sure if they have named the sickness in MN, but here in Michigan they have official named it “the crud” and I’m not joking about that, and those who have been hit by it this year, are swearing that is exactly what it is. I thought I would share that with you, just in case you needed an official name for the illness that has invaded your home. What a PRO this would be! I’m so glad to know others can handle JOURNEY music over and over and over and over . . . 😀 Wish I could do that at work! Sigh! And to do it without those disapproving looks! You are blessed with a wonderful opportunity to be at home and work at home! ENJOY! What do I say about you?? You are freakin’ hilarious, super talented, and I noticed on your You Tube sofunnyIcried Tom Cruise parody you like Fleetwood Mac. YOU ROCK!! Journey’s Greatest Hits?! Three times in a row?! That’s not even *close* to my record!! I believe I listened to it all the way from Northern NJ to Baltimore, on random repeat. LOVE IT!! Con: Delivery men look at you a little strange when you answer the door STILL in pajamas at around noon. I lOve you CAthy!Does that make me weird too? Love the entry title! So funny I had to read it to my husband! My kind of logic! I totally know how you feel. I work for a computer company so I can telecommute with some occasional travel to the home office or to a customer. I miss chatting with coworkers about current events. But, on the other hand I love have a 5 second commute and not having to buy lunch. TFS! Con: You can never walk away from work. It all becomes one big blur. Pro: lol. You’re so funny. No more scary tom crews laughs, ok. It’s stuck in my head.